QUESTION TIME | The current predilection of government politicians and mainstream media editors with the proliferation of fake news on social media is at strange odds with the prosecution of the co-founders of Malaysiakini under Malaysia’s cyber laws for merely broadcasting the press conference of a former Umno leader on KiniTV. 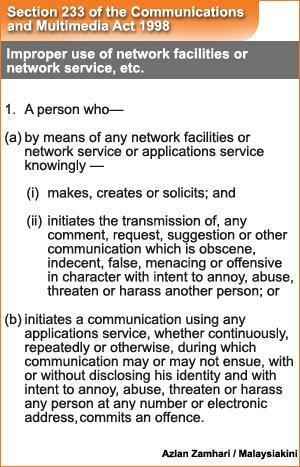 Editor-in-chief Steven Gan and CEO Premesh Chandran were similarly charged under Section 233 of the Communications and Multimedia Act 1998 (CMA) - an all-encompassing law (see table) which has not taken into account the need of news portals to report news. The video broadcast is of a press conference held by former Batu Kawan Umno division vice-chief Khairuddin Abu Hassan titled 'Khairuddin: Apandi Ali is not fit to be AG and he should quit immediately'. 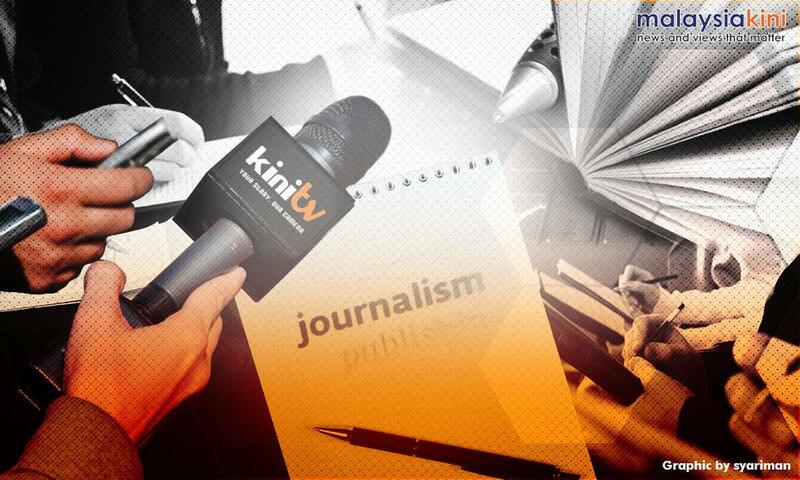 KiniTV Sdn Bhd was charged under Section 233(1)(a) of the Communications and Multimedia Act 1998 (CMA), which criminalises the deliberate and improper use of network facilities for communications that are deemed offensive, false or obscene, among others. The offence is punishable with a fine not exceeding RM50,000, or by imprisonment not exceeding one year, or both. An additional fine of RM1,000 per day is also imposed for each day the offence is continued upon conviction. When the editor-in-chief and the chief executive officer of a fair and independent news portal such as Malaysiakini get charged for reporting news - and in this case, the news can’t even be doctored because it is a video and there is no question of it being fake - it shows the system has scant regard for the truth. And that authorities are pursuing prosecution to stop the dissemination of true news. Don’t they have anything better to do? And is this yet another novel way of stretching the law to encroach into fair and independent reporting in cyberspace which is denied to those who want to do so in the print and broadcast media where severe licensing requirements allow revocation of licences without recourse to courts? There is fake news which is manufactured and untrue, then there is slanted news which reports part of the news selectively, leaving out others to deceive the public so they form a wrong impression, and then there is true or unvarnished news. It is strange that nobody gets prosecuted for producing fake news or for slanting news but there is prosecution of those who merely produced the unvarnished, plain and bare news. When government officials, mainstream media editors and ruling party politicians talk about fake news on the Internet, the intention appears to smear all operating there with one broad brush for their own propaganda purposes, ignoring the real contributions that news portals and blogs have made to uncovering truths which would never have appeared in the government-controlled mainstream media. They conveniently overlook the fact that has plagued mainstream media over the years and made most of them a tool of the political parties which effectively controlled them - The Star by MCA, Utusan Malaysia by Umno, New Straits Times, Berita Harian and TV3, once owned directly by Umno and now by government agencies. Other news media are controlled by business tycoons often beholden to the government but they forget at their own peril that there is legislation which considerably restricts their freedom to report news that is bad for the government.